This is not really true. The printing of money did accelerate hyperinflation, but it was not what had caused it. The main reason that the mark lost all its value in 1923-24 was that Germany had been invaded by French and Belgian troops looking to enforce the ‘Reparations’, which had gone unpaid for several months, and they occupied the Ruhr region for nearly a year. The Ruhr was Germany’s industrial heartland, and most German workers went on strike, refusing to manufacture goods while the occupation continued. The upshot of this was that the German industrial base was producing almost no goods, resulting in widespread shortages. With demand outstripping supply by many scales, prices for what few goods there were went spiralling upwards. With there being so little that the Deutschmark could be used to purchase, its value plummeted. 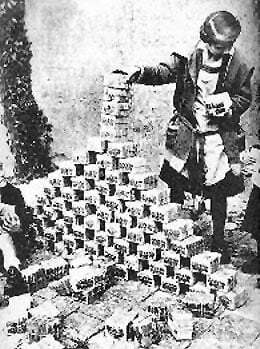 It was only after this process had already been well under way for some months, and the occupation was putting terrible pressure on the Weimar Government to co-operate with the ‘Reparations’, that the decision was made to print the money with which payments could be resumed. This is not to imply that printing money is a harmless idea, it isn’t, but in small amounts in isolation, it does very little damage at all. Insufficient goods to meet demand was the cause of hyperinflation, not the printing of money. What you’ve described is one cause of inflation which always occurs for a short period of time when there is a shortage. You have then incorrectly attributed it to being a cause of hyperinflation. Inflation due to shortages has a price ceiling before none of the goods are bought and/or alternative (cheaper) sources are found. That ‘new’ competition forces the previous suppliers to reset their prices lower or face the prospect of going out of business. Which is why inflation due to shortages doesn’t last long in a free society and absent any money printing. If instead of allowing that cycle to play out, money is printed without restraint, it is that printing and that printing alone which causes hyperinflation – not the shortages. There has never been a single case of hyperinflation without printing. Shortages can ONLY ever cause inflation which in Germany, as you said, had only been underway for ‘months’. Printing is the cause of hyperinflation and not only does it increase the extent of the damage but extends its duration to many years rather than weeks or months. You have neither explained nor demonstrated why. 1-What if the CB prints money NOT to give to everyone, but only to SOMEONE? What is there to prevent the Central Bank, say, from printing money to benefit a mistress of the bank chief, by ‘creating’ new money into her bank account? Who is there to audit or monitor the CB? What if this problem is writ larger — the ruling party ‘creating’ new money for itself by, say, buying up the private bonds of that party, while appointing party allies as the team of auditors to ‘audit’ the CB (and specifically, to whitewash all these questionable transactions)? If they could keep this kind of abuse to a manageable extent, couldn’t they avoid creating appreciable inflation in the economy, eg. if they keep the ‘printing’ low, to, say, 0.01% of the CB’s balance sheet? Teyvan,the world does not follow economic principals that are taught in universities.In the case of Germay at that time there were other reasons than money supply.Teaching economics as a perfect science is a joke and hoodwink by those who have something to gain over the gullible.Money can and is controlled by powerful people our current economy is based on exchange of currencies created by those people.Teach the reality,but then you cannot.The system would dispose of your position. Inflation at its most basic definition is ” too much money chasing too few goods ” In 1976 we had high inflation ( too much money in the economy ) yet we had to go to the IMF to borrow MORE money. Why as a sovereign nation could we not just print our own money ? Also how do we know the money we received from the IMF hadn’t just be ” printed ” by other nations ? What if governments print money against a proposed major infrastructure project in the country and release it for the project in stages of completion? So in this case money is printed against an asset build. This will also put more job for the people and hence economy will benefit and grow. Does that make sense in economics? then what is the best way to eliminate inflation? I still don’t understand how inflation happens. If you double the money supply, and people with double money will end up buying all the books in two weeks (as opposed to four weeks with less money as was before), why the vendor of books can’t just wait until the end of month to bring new books for sale at the same price without doubling it nor doubling the amount of books? Why the vendor has to double the price – I don’t see it necessary? If the price stays the same, your product will be sold out anyway but faster? So, why that would cause him to double the price, which in turn would be the cause of inflation????? If excess money is available, it would increase effective demand, meaning that more people who were willing are now able to purchase the goods. This causes an increase in demand over supply, causing a shortage in the availability of the goods. 2) if producers then try to produce more goods to meet the higher demand, they have to demand more raw material, the higher demand for the raw materials has also increased the price of the raw materials leading to a rice in production cost, and consequently a rice in the price of the goods. Consider this, if the whole world’s Governments agreed to print money solely to pay for its social care of people. The “Humankind” gain would solve more problems than it would create! It can be audited to prove its effectiveness and fairness so why don’t they go bravely forward and do it??? The last American president who had the nation print its own debt free currency was assassinated & a failed attempt was made on the life of the president who ordered the Grace Commission. But somebody ultimately has to pay for the money being printed for the social care. In this case, it would take the money from anybody with savings, via currency devaluation. Taxing the rich and giving it to the poor, via social care schemes is a better approach, as it is has less side effects on the currency. In term of doubled the money supply to the economic, the prices of the commodities will shot up in the market.and more the wages fall . which will enable the workers to look an other work from external or NGOS to look for high wages.if the government wish to maintain its employees its has to rise the wages rates equivalent to the inflation level that i compared to in south Sudan in which the central bank print more money to the economics which shot up the inflation rate up to almost 200% now 2018. with out increasing the salaries for the employees to make sure that their payment may buy something in the market but they fail to do so. now i don’t know what will happen in few months or years if they continue to print money with out knowing the money in circulation and with out satisfying the needs of employees. Why does not government print money as it wishes then prevent firms from pushing up prices? The system of demand and supplie has always had flaw ,due to the poor always became poorer ,it’s a mechanism the more fortunate created to became rich so it can benefit them .Those people will always hold up the system of demand and supplier ,for they will loose out the most due to their value of money. The system of supplier and demand is a mechanism to have control over the poor. The mechanism of demand and supply was not created by anyone it a principle of cause and effect simple . Why Can’t Govt print money to import goods from Other countries,this will increase supply and fulfil demand may help us to reduce Current inflation? Ok so we cant print more money because then suppliers would increase prices, so it would be pointless. So why cant we cap what suppliers can sell items for?? for example bread, a loaf of bread can cost no more than £3 or Milk etc. Why can’t the government enforce businesses to not be greedy, just because there is more money for the people doesnt mean the wealthy should take it because they can. We have so many multi-millionaires who have more than enough but will keep hiking prices and paying there staff the same wage. We need the whole country to have a conscience and look at the reality of the way fellow citizens are living. I come from a wealthy family and work very hard for my money to support myself and my son and get help from my parents as i wouldn’t be able to survive. But whenever i see a homeless person, charity box, someone in need I always give what i can. If the big bosses stopped being greedy and reward hardworking people with larger salaries and bonuses then money would be pumped back in to the economy rather than sitting in a rich man’s bank account. And lastly the government should be massively enforcing corporte tax, were the likes of Amazon, Ebay, Virgin etc cannot keep getting away with not paying there rightful amount of tax. Stop going after the little people and getting them in debt, homeless, starving, depressed, broke, suiciadial etc. We need massive shift in the way this country runs and the way we all look after each other!!! Still does not make sense. If money is printed for and isolated transaction. Say a country owns another country money, why cant they just print the money and that will be the end of it. Now harm done to the local economy. No inflation. Money which is just printed off has no value. This might not immediately affect the local economy, but will eventually do so, via interactions with the other country being defrauded.